These are days of struggle for the Munduruku people. I left home with the other women on November 20, for a meeting about our participation in the struggle for Indigenous rights. We spent four days preparing ourselves for the protest and for the meetings that we would have in Brasilia with the Brazilian Ministry of Justice. On the 23rd we met the men and started our trip to Brasilia. We traveled four days and four nights to get here. We are a group of 22 women, eight children and about 60 warriors. In front of the Palace of Justice, we placed large red letters on the lawn to send out our message — “Demarcation right now”. We also left 180 arrows on the lawn to remind the Ministry of Justice that their 180-day deadline is over. Now the government needs to recognize our right to our traditional land. I brought my four-month old baby to Brasilia and left my other four children in the village. We have to defend our Amazon, because it is not only our Tapajós River, it is all the rivers in the Amazon that are being affected. We’ve seen other rivers die, so we do not want that to happen to our Tapajós. We want to make it clear to the government that we, Indigenous women, are all of the same blood and our claim is the same: to defend our territory, our river and our forest, which is our mother. Because of the government, our forest is shedding tears. Tears that fall like milk from our breast. We have seen that many people are supporting us and this strengthens our fight. The Minister of Justice has not yet agreed to meet with us since we arrived in Brasilia. The president of FUNAI (the Brazilian Indigenous Rights Agency, Agostinho do Nascimento Netto) was sent to speak with us and said that FUNAI does not have enough staff to review all demarcation requests and therefore has not yet sent the documents to the Ministry of Justice for review. But I am confident that the Minister of Justice (Alexandre de Moraes) will welcome us. We do not believe that the minister will refuse us who have come from so far. UPDATE: The Munduruku were also received by the Federal Regional Court and the Federal Supreme Court. 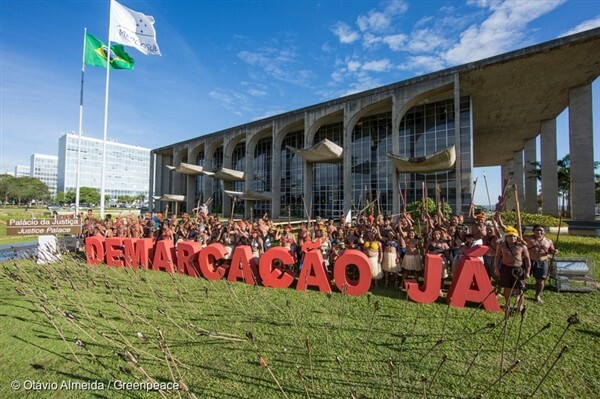 Meanwhile, the Minister of Justice, Alexandre de Moraes, ignored the presence of the Munduruku in Brasilia. 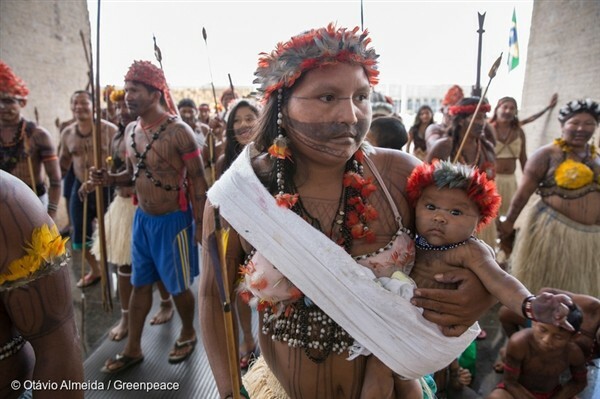 Add your name to stand with the Munduruku people as they seek the rights to protect their traditional lands. Maria Leusa Munduruku is an Indigenous leader from the Munduruku Land in the Brazilian Amazon. Maria was interviewed by Vânia Alves from Greenpeace Brazil. Originally published by Greenpeace International on December 13. We're an independent global campaigning organisation acting to change attitudes and behavior, to protect the environment and promote peace.